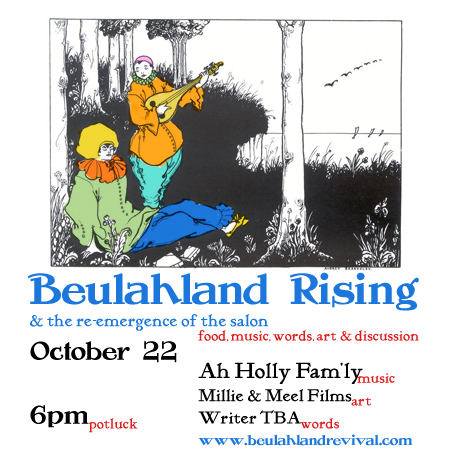 This is a special treat to have Jeremy Faulkner of Ah Holly Fam'ly make a stop at Beulahland on his way back west to Portland, OR after an epic cross country tour this fall. His thoughtful lyrics, deft guitarmanship, and distinct vocals (which seem to echo straight from the mountains of Idaho) will haunt and delight you. This event took place on October 22, 2010. Unfortunately, Jeremy had last-minute itinerary changes and was unable to make it. Tyler, however, gave a thoroughly engaging reading. In addition, the digital projector finally made its debut.